Rootstock long and stout, sometimes branching. The earliest leaf blades ovate and blunt; the later ones oblong-ovate, acute, finely pubeso especially beneath, the margins crenulate toward the apex, the bases usually somewhat heart-shaped or truncate and sharply toothed, incised or auricu-late. 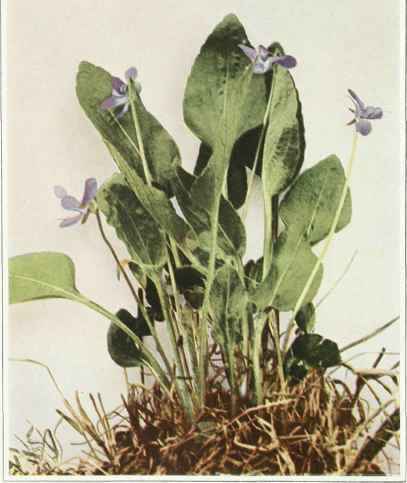 Flowering stalks about as long as the leaves when first in bloom or longer than the leaves in later flowers; the corolla violet-purple. Cap green; seeds brown. Cleistogamous flowers on erect peduncles. Dry fields and hillsides, throughout the eastern states and south to Georgia. Flowering in May and June.